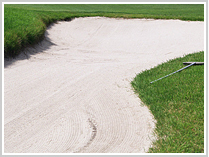 Many kinds of sand are employed in golf courses depending on the usage, such as for fairways, greens, bunkers, and so on. For bunkers, the sand must be suitable for each situation, matching the surrounding colors and course difficulty.For greens, washed sand and burnt sand are used.The sand for greens should be of supreme quality as it may decide the winner of the game. This is where our Aomori Luna Sand is widely used. Aomori sand is produced in Rokkasho Village in Aomori Prefecture and is considered the premium brand of sand because of its high quality.The sand has the ideal permeability and pH value for greens with high compatibility with turf, whitch is why it is chosen by greenkeepers and construction companies. Here are the advantages of Luna Sand for golf cources. Each grain is round and even in size, which allows it to retain proper permeability without becoming compacted. The proportion of components such as coarse sand, fine sand, clay and silt gives it the ideal particle size distribution as sand for golf course greens. The proper specific gravity as sand for golf course greens enables it to settle rapidly in the turf. With proper hardness, it is not compacted easily and so can be used for a long time.